On April 9 the presentation of the disk "Maragha" produced by the Milky Way Studio took place at Artsakh State University. April 10 is the 15th anniversary of the tragedy in the village of Maragha, Martakert. In the night of April 10, 1992 the Azerbaijani special operational force and the Fourth Soviet Army stationed in Kirovabad attacked the village, which had a population of 5 thousand by that time. The 200 militants of the village could not stop the tanks and the armored machines, and the Azerbaijanis captured the village. In four hours Maragha was liberated by the joint defense squads. However, the Armenian militants still remember the horrible picture they saw. Dead bodies torn to parts, people burnt alive, old people and children taken hostages… People were not just killed. "It was perhaps the bloodiest episode of the war in Artsax. What happened in Maragha was the consequence of the policy conducted by Azerbaijan for years on. The seeds of hatred grew at the convenient moment – Sumgait, Maragha… Unfortunately, the policy of inciting hatred continues, which does not allow setting up friendly relations between our countries," said Speaker Ashot Ghulyan during the presentation. "The massacres of the peaceful population in Maragha had nothing to do with the military actions. These people did not threaten Azerbaijan, the village was not a weapon emplacement. However, the criminals have not assumed responsibility yet," said Vahram Atanesyan, the chair of the Committee of External Relations. Narine Aghabalyan, director of the Milky Way Studio, said the disc contains documents, stories of witnesses, the participants and the victims, photos, footages of the next day of the tragedy, as well as a film based on the stories of witnesses. After the liberation Baroness Caroline Cox arrived at the village. An interview with her and passages from her book about ethnic cleansing were included in the disk as well. Narine Aghabalyan told that the only effort to make the events in Maragha known to the world was made by the Organization Against Legal Arbitrariness (director Larissa Alaverdyan). A lot of materials were accumulated, which were to be presented to the UN but the work stopped halfway. All the materials that the organization had collected were included in the disk. Narine Aghabalyan said the NKR Ministry of Foreign Affairs provided archive materials and legal documents. The disk also includes newspaper stories. The production was sponsored by the American businessman Vardges Anivyan, the owner of the milk factory of Stepanakert. "According to these materials, on that day 81 people were slaughtered, 67 were taken hostages. Some hostages were later returned or exchanged, but many are still missing. 260 families, 880 people, remained in Artsax after those events. Now the village of Maragha is in the neutral territory. In satellite photos we can see that the village has been razed to the ground," Narine Aghabalyan says. "In New Maragha 530 people live. We started living in this village because there is nowhere else we can go to. And we have the right to live there until we return to our native village," said the head of the community of Nor Maragha Roma Karapetyan. Most inhabitants of Maragha live in Russia. "We still have contact with them, but they are reluctant to return," said the head of the community. "Azerbaijan was able to persuade the UN to send a mission to Artsax to "prove" that Armenians live in the liberated territories. Where are the people of Maragha supposed to live? Where are those 7000 people who lived in Maragha, Margushavan? Isn't the UN supposed to think about them?" Narine Aghabalyan said. On April 9 the presentation of “Maragha”, a CD by the TV reporter Narine Aghabalian, took place at Arsakh State University. “Maragha” includes footages, documents, photos about the massacre of Armenians in the village of Maragha, Martakert region. The first part includes an interview with Caroline Cox, member of the British House of Lords (2006), the footages of the next day of the Genocide. The second part includes the stories of the people who survived the massacre, IDs, newspaper and internet stories, maps, satellite photos. Most documents were provided by Against Legal Arbitrariness Foundation (Armenia) which prepared on protocol 1503 a package document in 1996-1997 to report to the UN Council for Human Rights, but failed to for whatever reason. The section of photos contains photos of exhumation, the victims, Nor Maragha. “We must remember and remind everyone about Maragha. We owe to the people of Maragha who were killed or now live in different parts of the world,” said Narine Aghabalyan during the presentation. “It is the most tragic part of the history of Artsakh, which made me start a quest for materials to assemble the mosaic of information about the massacre in Maragha. There are different lists in archives, different figures are offered. Those lists were compared, a new list was drawn, and according to it 81 were killed, 67 were taken hostages. Study continues because the witnesses of Maragha are now living in different parts of the world, and it is difficult to restore the real picture of the tragedy of Maragha.” NKR Speaker Ashot Ghulyan highly appreciated the CD and described it as a breaking through the wall of propaganda and a process which must continue to tell the world about the genocide of Armenians in the village of Maragha, Martakert. He said the CD contains evidence to the genocide committed in Maragha, which we can present to the international community, international organizations. “Sumgait continued in Maragha, massacres, a genocide planned and perpetrated by the Azerbaijani government,” Speaker Ashot Ghulian said. “Maragha” was produced by the Tsir Katin Studio (Stepanakert) in 500 copies in Armenian, Russian and English in association with Vardges Anivian. Tsir Katin is also likely to set up a webpage with the materials included in the CD. Thereby the authors of the project want to get in touch with the people displaced from Maragha, who are now living in different parts of the world, and find out details of those events to get the complete picture of the genocide. The process will also enable the people of Maragha to defend their rights and to get compensation later. daughter-in-law. It took her breath away. warm body on her breast and she gasped for breath. inhabitants as hostage. They burnt 153 houses. Because simply lot worse things happened in 20th century hence it dilutes the article of its content.Sadly when we try too hard we make it trivial without wanting to..
45 people weremassacred in Maraga(Leninavan) settlement, Mardakert region, on April 10, 1992. 49 people were taken hostage, including 9 children and 18 women. The destiny of 19 people is still unknown. The slaughter continued on April 22-23, when the survived residents of Maraga returned to bury those dead. The data is confirmed by Helsinki Watch international human rights organization. 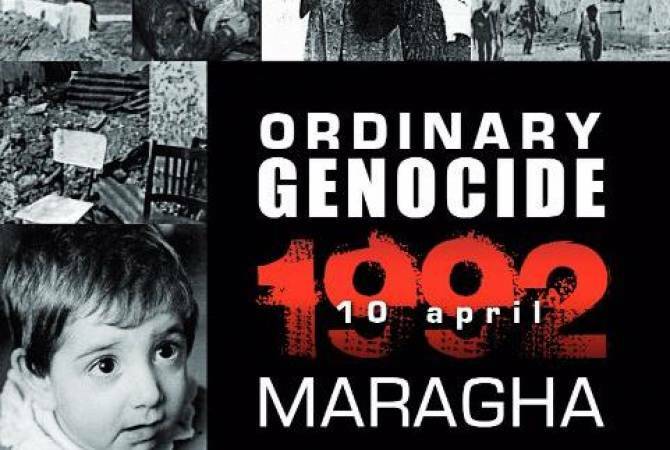 The Maraga tragedy is viewed as one of the most horrible examples of genocide and is considered among Azerbaijan's bloody crimes in Getashen, Martunashen, Buzluh, Erkej and other settlements in the north of Nagorno Karabakh Republic at the time of aggression in 1991-1992. Unfortunately, the Maraga tragedy was not appropriately covered by foreign media, while the world community has not given a relevant assessment to it. The tragedy in Maraga inidcates that residents of Maraga orother Artsakh territories occupied by Azerbaijan cannot once again be under Azerbaijan's yoke. Armenians of Nagorno-Karabakh and Azerbaijan. claimed its rights to a free life and declared the independent NKR. people, I saw burnt bodies; apparently, some people were burnt alive. attacks and was actually wiped out. judging by their current cynical behavior, are not going to repent. Azerbaijan's power, have passed through a lot". for efforts to raise international awareness of the tragedy. after the country's joining the United Nations and OSCE (1991). you come from," she continued. and translated into different languages, especially Turkish. Sumgait and Maraga [pogroms], but that isn't even a slight piece,"
raising publicity of the tragic crime. on ceasefire in the conflict zone in May 1994.
butchers that realized the Armenian Genocide in the early 20th century. cross both on the corpses and the people who were alive. beyond the normal human logic. and determine the final political status of the Armenians of Artsakh. Today is the 24th anniversary of the Maragha massacre. The Maragha Massacre was the mass murder of ethnic Armenian civilians. punishment by the international community. “It was like Golgotha…” Baroness Caroline Cox said after witnessing the atrocities committed by the Azeri armed forces in Maragha on 10 April 1992. April 10 marks the 26th anniversary of the Armenian massacres in the Artsakh village of Maragha by the Azerbaijani authorities. On April 10, 1992, after a 3-hour artillery preparation, the subunits of the Azerbaijani regular army invaded the peaceful village of Maragha from the Azerbaijani Mir-Bashir (currently Tartar). The attack was not dictated by military necessity. Over 100 people became victims of the aggression – mainly women, children, and old people. Civilians were killed by the most cruel ways: they were partitioned, burnt alive, beheaded, thrown under tanks, or cut with axes. About 50 people were taken hostages, including 9 children. While in captivity, many Maragha residents were tortured, humiliated, and were a subject to an inhuman treatment. Many of them were later exchanged, but the fate of many is still unknown. In about two weeks, on April 22-23, Maraghawas again attacked, people, who had returned to the site of fire, had to leave the native town forever. Speaking at a news conference on Tuesday, Larisa Alaverdyan, Head of the Foundation against Violation of Law NGO, stressed the Maragha massacre had one essential difference from the genocidal actions committed by Azerbaijan in Baku, Sumgait, Gandzak and in over 300 other settlements in Artsakh – they were planned and committed by newly independent Azerbaijan. Maragha was a big village with a population up to 5,000 people. According to Alaverdyan, who is also Armenia’s ex-ombudsman, it was a very developed and rich village, which did not see military operations, but the resident villagers were involved in the operations in the neighbouring communities, like in Talish or Mataghis, feeling the imminent threat to themselves. Before the Azerbaijani attack against the village in April 1992, almost all the inhabitants of Maragha had been evacuated; only some 110 people – mostly women, children, and elderly – did not manage to flee the village due to some objective reasons. “Azerbaijanis clearly noticed it, understanding that young women having sick and helpless kids could have remained in the village, and planned it [the massacres]. This was a genocidal plan targeting the civilians,” Alaverdyan said. She added the Foundation against Violation of Law NGO was the first one to document the events upon receiving the news on the atrocities from Artsakh on April 10, with the Russian and foreign radio stations reporting on the incident on April 11. “It was not accidental that Baroness Caroline Cox visited the village after two-three days. The people in Maragha were massacred since they were Armenians, helpless without any chance of resistance; the slaughter was planned in this context,” she stressed. In 1996 the Foundation against Violation of Law NGO managed to prepare a comprehensive reference on the events in Maragha and presented it to the Artsakh authorities, who submitted the document to the UN Commission on Human Rights and other international organizations for several times. “Unfortunately it was not followed by any developments by the state or some kind of response. We kept on looking for people who were taken hostages,” she said, stressing the people of the village were killed by most brutal ways. “People were sawed off, with the eye witnesses of the atrocities going mad afterwards,” she added. Alaverdyan noted the fate of 19 hostages still remain unknown. “This was committed by modern Azerbaijan, which at least bears the responsibility to tell us what happened to those people. We once again made a decision to prepare a package of legal documents to submit them to international organizations,” she added, calling on the state structures and business community representatives to organize those works, stressing the need to involve experienced foreign experts in drawing up the documents. YEREVAN, APRIL 12, ARMENPRESS. Considering the documented data and the eyewitness accounts it must be indicated that what happened in Maragha on April 10, 1992, fully corresponds to the military crime and genocide terms, Ashot Melyan, Deputy Head of the Artsakh Republic Representation in the Republic of Armenia, said during the public hearing dedicated to the 27th anniversary of the massacre in Maragha on April 10, at the Armenian Genocide Museum-Institute. Melyan stressed the fact that Shahin Taghiyev, the commander of “Gurtulush” military unit was awarded the title of “National Hero of Azerbaijan” for his involvement in the Maragha Genocide. “It’s a proof of not only the encouragement of these actions by the Azerbaijani authorities but also the deliberate Armenophobia policy”, Melyan stated. Recalling the brutal murder of the Armenian officer in Budapest and the glorification of the perpetrator, Melyan noted that the atrocities committed against the Armenian civilians during the April war are the logical continuation of the Maragha Genocide. According to Melyan, we must not forget that the Nagorno Karabakh conflict still remains unresolved, and the Azerbaijani authorities continue the anti-Armenian propaganda among their own population, provide their army with weapons not giving up on the option of the forceful resolution of the conflict. “We must be vigilant and cautious, ready to deliver a counterattack if needed in order to prevent this kind of crimes from happening”, Melyan noted. Ashot Melyan also underlined that the authorities of the Republic of Artsakh have regularly raised political assessment about the Maragha Genocide on the level of the President, the Speaker and the Minister of Foreign Affairs. "Due to the efforts of the authorities and the “Hayastan” All Armenian Fund, the village of Nor Maragha is gradually being developed, where since 1995 a few of the survivors of the Maragha massacre have been settled”, Melyan added. According to Human Rights Watch/ Helsinki Watch, as a result of the genocidal acts committed by the Armed Forces of Azerbaijan, 50 civilians were killed and 50 were captured from 118 peaceful residents in Maragha. Some of them were later exchanged, whereas the fate of the 19 people from Maragha still remains unknown.